Woken this morning by the wind rattling through the trees and the rain drumming hard against the windows. 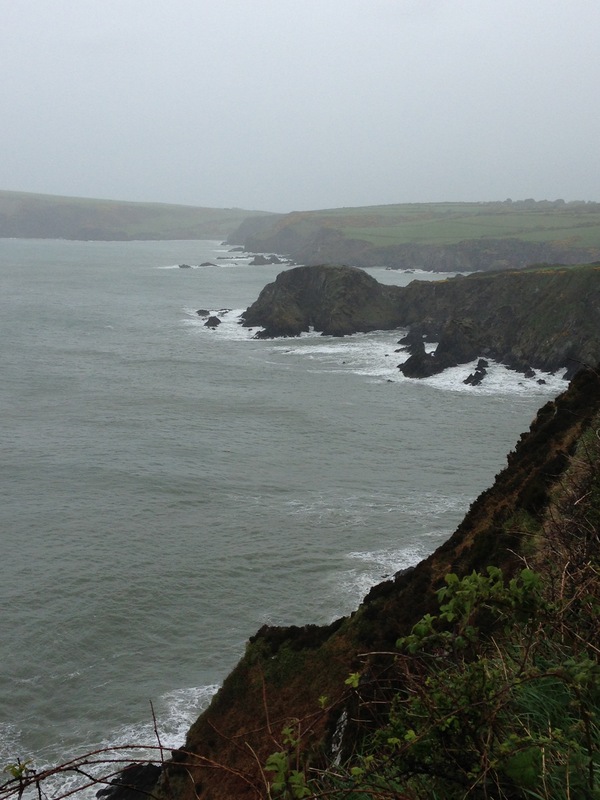 It looked like we wouldn’t get a very good start to the day and our first hike along the Pembrokeshire Coastal Path. After a hearty full Welsh breakfast we donned our waterproofs and packed our day packs securely then set off for the town centre (about 100 yards). 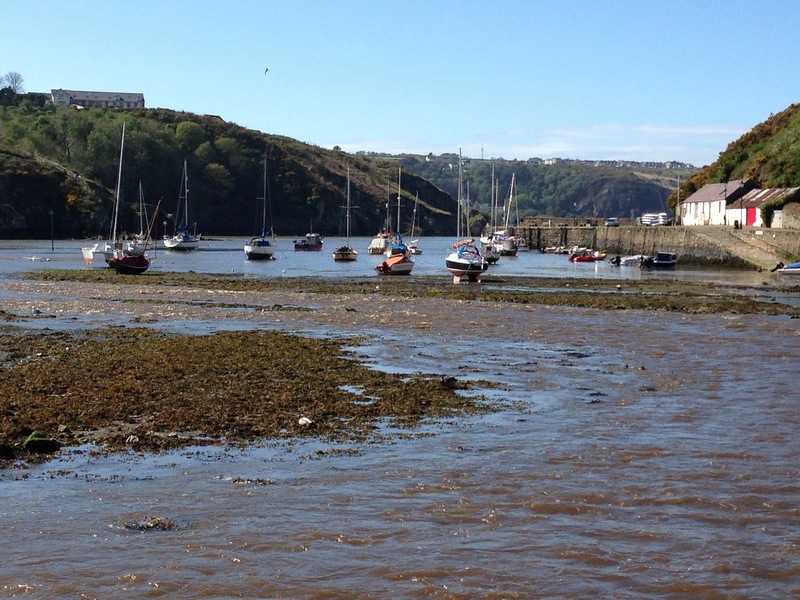 The plan: to take the bus towards Fishguard, jump off half way by the caravan park, link up with the coastal path and hike back to Newport via Pwllgwaelod and Dinas Head. The reality was, that as soon as we alighted from the bus we were confronted and immediately battered by the elements. Heavy horizontal rain and wind gusting up to 65mph, making it difficult to stand in open exposed areas. 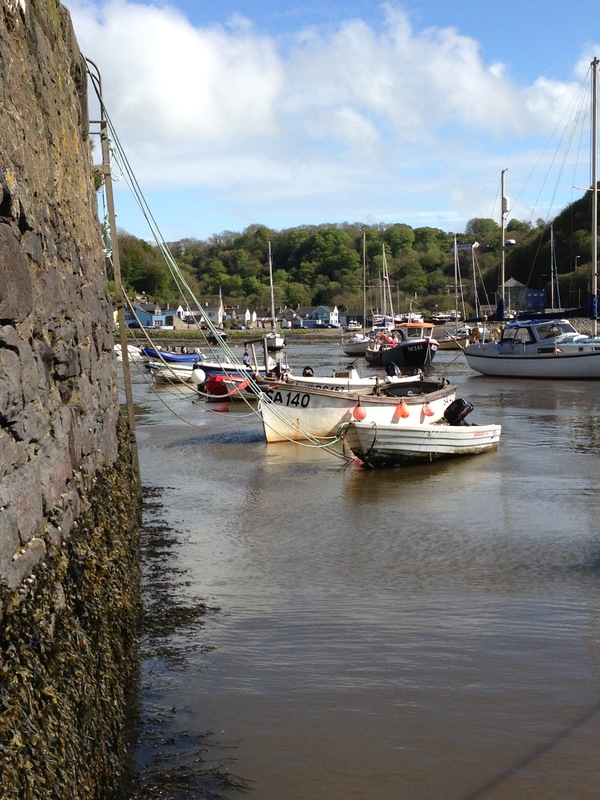 However, with laughter and strong wills we set off down the narrow lane through the static caravan park, clinging like a limpet in parts to the cliff edge. The sea was dramatic and the views spectacular. The cons: you have to keep your head down against the rain and correct your footing constantly. The pros: a carpet of flowers along the way. Bright buttery yellow Primroses and stands of bluebells. I’ve never seen so many! After 3 miles the additional effort of walking in these conditions, for the group, was begging to tell, time to make the decision to quit. 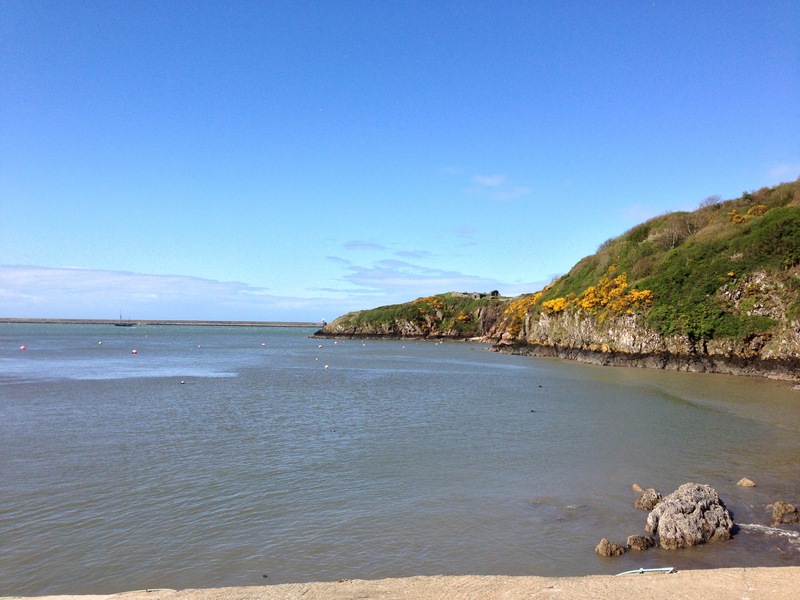 The decision was assisted by the arrival of the bay and road at Pwllgwaelod, not to mention the Old Sailors restaurant. We piled inside thankful to be in the warmth , safe from the wind and rain. We all agreed that we should take a bus or taxi back to Newport after each ordering a bowl of Cawl, a traditional Welsh stew of lamb and vegetables. Delicious! It was a 15 minute walk up to the main road where we would find a bus back home. 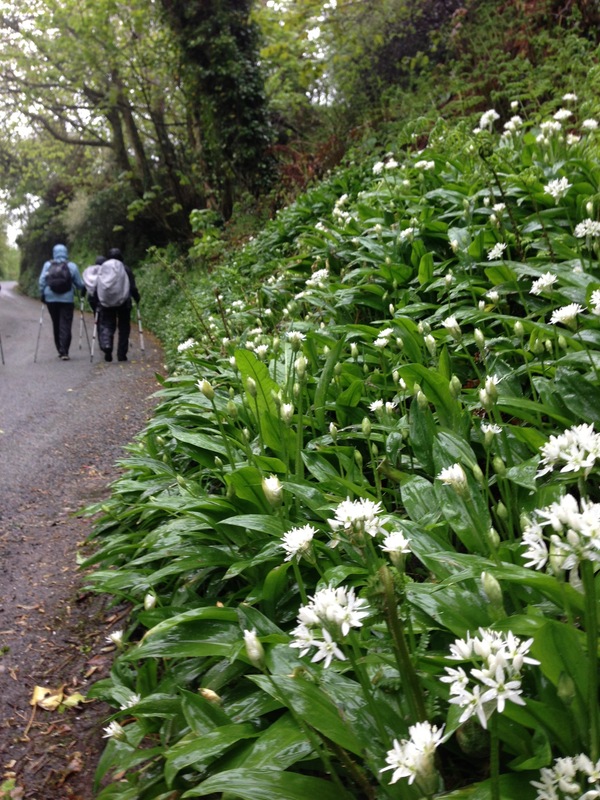 Walking up the hill we came across verges and banks literally carpeted with Wild Garlic, it’s pungency evading through the dampness. I would pick bunches of it if I was near to home as its wonderful to cook with – a Wild Garlic Risotto. Yum yum! The season for Wild Garlic is short lived, around 3 weeks, so if you see some (you’ll probably smell it first on a warm day) grab it, take it home and look up the recipe or ask me for it 🙂 It can be frozen too to extend its culinary season. Ten minutes later we were on the bus for the 3 mile journey home and arrived in Newquay just in time to be met by the sun. Whilst the ladies wend their way to check out some of the local craft shops, I sneak off to take advantage of the spare time, to catch up on some work and grab a few more photos. Previous Previous post: Croeso i Gymru! – Welcome to Wales!